MUMBAI: After having gotten Malaysia, Egypt, Australia,China, Thailand, Singapore, Turkey , Dubai & the Middle East to tap their feet to his beat DJ Praveeen now unleashes his first music album â€? Burn D' Dance Floor' filled with his trademark style and funk catering to today's â€?It' generation. DJ Praveen Nair's innovative sounds will entertain music lovers herald a new wave in remixes, house and fusion music. The album brings forth Nine (09) honest & introspective songs from the heart, voices from the soul & a sound that appeals to a broad audience; not to forget 04 (four) extended re mixes. Burn D' Dance Floor consists of hits from yester years like â€?Kero Mama', â€?Tu Mujhe Jaan Se Bhi', â€?Khoye Khyoe', â€?Yamma Yamma' likeyou've never heard before. After 16 long months of extensive hard work, keeping aside personal hardships, the highs & the lows with moments of inspiration, DJ Praveen Nair has finally arrived and how! The 18th of June saw the launch of Burn D' Dance Floor, an event hosted by Cyrus Sahukar. The launch saw the presence of 150 celebrities, the likes of Mona Singh, Mandira Bedi, Lucky Ali, Vishal Shekar, Suresh Menon and many others. 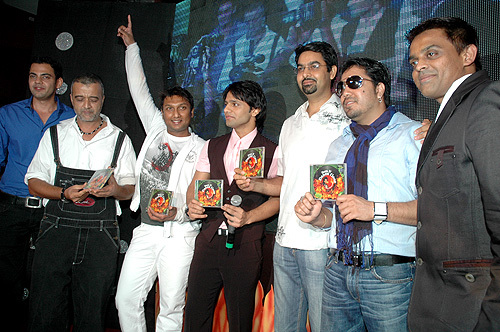 Also featuring on the Album are artistes like Akriti Kakkar, Javed Ali, Apurva, Mahua Kamat, URI (Earl) and many more. The special feature of the Album is a Video track sung & filmed on Rahul Vaidya.